It’s been a good start to the season for the French. Thomas Voeckler stands out but there have been plenty of wins from others, from Samuel Dumoulin and Jérémy Roy as well as strong performances from Yoann Offredo. Another name to add to the mix is Skil-Shimano’s Alexandre Geniez. The 22 year old rider has just finished fourth overall in the Critérium International, built on fifth place in the “mountain” stage finishing on the Col de l’Ospedale and secured with a 20th place in the time trial. He left several big names trailing and even lamented that more people didn’t attack on the final climb. It’s not a freak result, he was 12th on Mont Faron in the Tour Méditerranéen and then seventh in the Vuelta a la Region de Murcia, behind a sizzling Contador. He’s from Flavin, a village near the sleepy town of Rodez in southwest France. He started riding with a local club aged 14 but was mainly interested in mountain biking. He spent the summer of 2006 working in his local town hall to collect money to buy his first bike, a second hand Pinarello Prince. From there he rose up the ranks quite quickly, combing studies and an apprenticeship with aeronautical giant Airbus with sport. He was sometimes training at night thanks to lights on his bike. By 2008 he was an elite rider with a big amateur team in Toulouse and come 2009 he joined French amateur squad VC La Pomme – an outfit that deserves a mention on this blog someday soon – where he won the presigous Ronde de l’Isard stage race in the Pyrenees. Geniez also studied, obtaining a university diploma in Sports Management. He turned pro in 2009. FDJ were after him but wouldn’t offer him a contract to turn pro straight away. Cofidis too were on to him. But Skil-Shimano offered him a good deal with a three year contract and he jumped at the chance, even if it meant riding in a foreign team, the deciding factor being that they would pay for him to finish his studies. It looks like Skil got a bargain. His first year was solid, a few top-10 rides, including seventh overall in the Tour of Luxembourg amongst some heavy hitters, and best young rider too. There was a podium spot in the Route du Sud, almost on his home roads. But he said he wasn’t too happy with the year, finding his form too inconsistent. A quiet rider who prefers hilly terrain and confesses to hating flat and windy races, he comes across a lot like David Moncoutié, even sharing a similar path as an amateur to the Frenchman. Don’t be surprised if someone labels him as “the new Moncoutié” although Geniez appears more ambitious, a man with plan compared to the sometimes infuriatingly carefree Moncoutié. He’s categorised as a climber but his build and TT results suggest there’s more under the bonnet. Another French ride to watch, the years go by and many exciting talents never step up. It’s one thing to make the top-10 by surprise, the hard part is to deliver results when others are expecting. 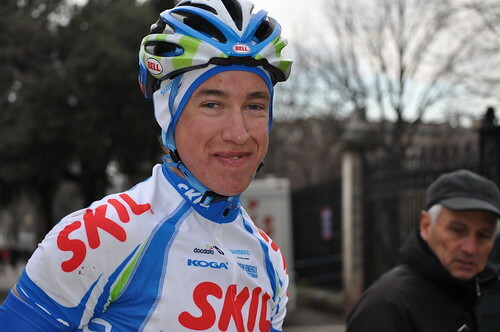 Just ask Jérôme Coppel who was stuck with a stomach bug in the Critérium International. But I can’t help feel there are more and more talented French riders. They have to assume some pressure but the weight of a nation can be carried more easily when you have several riders instead of one or two. The ability to ride uphill as fast as he did on Corsica doesn’t come by chance, this was no tactical fluke either. Add him to the watchlist and don’t be surprised if he’s up there in the hilly races this season. He’s also got a good website at http://alexandre.geniez.free.fr (in French). It’s got plenty of simple info and photos, all clearly set out and it’s kept up to date as well. A nice read, shame he won’t get to ride the Tour de France as Skil Shimano are not picked. Nice write-up indeed. I first spotted Alexandre as he was riding for GSC Blagnac, in 2008 and quickly offered him a contract for my virtual Cycling Manager’s game 🙂 Nice to see a steady progress.. he’s not thrown to the lions too soon, as Di Gregorio was (though he seems to refind his former potential again, it seems). Geniez was oustanding at the U23 World Championship in 2009, paving the way for Sicard to shine, while Alex still managed to crack a top10, despite the work. If I remember correctly, Sicard was a teammate at Blagnac. Duncan: true but he’s too young for the Tour. If he keeps up the results though, Skil might get an invite. Reno: yes he was with Sicard in the amateurs for a year before Sicard moved to Orbea and Geniez went to VC La Pomme. I drew the parallels with Moncoutié because of the south-western France connections and their time at GSC Blagnac. Note J-C Péraud was also with the Toulouse team. It’s one of several clubs in France that “form” the riders for the pro ranks. As I say I must write about La Pomme one day. As for Di Gregorio, he was “thrown to the lions” but given a giant salary at FDJ. Perhaps it wasn’t so much the media pressure but the easy money? He’s taken a big pay cut with Astana. A nice read, thank you. I saw the name in the results but it did not really register, now I feel I know more about him, that I want him to do well. Perhaps one to watch for the Fleche Wallone? Jarvis: it’s a story that keeps on giving. MRG: yes, that’s the point, to give some detail to the people involved. bikecellar: perhaps but the big teams will want to control the race so that the likes of Scarponi, Evans, Contador, Gesink, the Schlecks and others have their say. Not sure if he can match them. Mark Rushton: yes, he seems to have negotiated a good deal here. Most riders would just turn pro with the first team that put a contract under their nose, he seems to have waited and negotiated.